My Fair Lady is a 1964 American musical film adapted from the Lerner and Loewe eponymous stage musical based on the 1913 stage play Pygmalion by George Bernard Shaw. With a screenplay by Alan Jay Lerner and directed by George Cukor, the film depicts a poor Cockney flower seller named Eliza Doolittle who overhears an arrogant phonetics professor, Henry Higgins, as he casually wagers that he could teach her to speak "proper" English, thereby making her presentable in the high society of Edwardian London. The film stars Audrey Hepburn and Rex Harrison as Eliza Doolittle and Henry Higgins respectively, with Stanley Holloway, Gladys Cooper and Wilfrid Hyde-White is supporting roles. A critical and commercial success, it won eight Academy Awards, including Best Picture, Best Actor, and Best Director. In Edwardian London, Professor Henry Higgins (Rex Harrison), a scholar of phonetics, believes that the accent and tone of one's voice determines a person's prospects in society. In Covent Garden one evening, he boasts to a new acquaintance, Colonel Hugh Pickering (Wilfrid Hyde-White), himself an expert in phonetics, that he could teach any person to speak in a way that he could pass them off as a duke or duchess at an embassy ball. Higgins selects as an example a young flower seller, Eliza Doolittle (Audrey Hepburn), who has a strong Cockney accent. Eliza's ambition is to work in a flower shop, but her thick accent makes her unsuitable. Having come from India to meet Higgins, Pickering is invited to stay with the professor. The following morning, Eliza shows up at Higgins' home, seeking lessons. Pickering is intrigued and offers to cover all expenses if the experiment should be successful. Eliza's father, Alfred P. Doolittle (Stanley Holloway), a dustman, shows up three days later, ostensibly to protect his daughter's virtue, but in reality simply to extract some money from Higgins, and is bought off with £5. Higgins is impressed by the man's honesty, his natural gift for language, and especially his brazen lack of morals. Higgins recommends Alfred to a wealthy American who is interested in morality. Eliza goes through many forms of speech training, such as speaking with marbles in her mouth, enduring Higgins' harsh approach to teaching and his treatment of her personally. She makes little progress, but just as she, Higgins, and Pickering are about to give up, Eliza finally "gets it"; she instantly begins to speak with an impeccable upper class accent. As a test, Higgins takes her to Ascot Racecourse, where she makes a good impression initially, only to shock everyone by a sudden lapse into vulgar Cockney while cheering on a horse. Higgins, who dislikes the pretentiousness of the upper class, partly conceals a grin behind his hand. Eliza poses as a mysterious lady at an embassy ball and even dances with a foreign prince. At the ball is Zoltan Karpathy (Theodore Bikel), a Hungarian phonetics expert trained by Higgins. After a brief conversation with Eliza, he certifies that she is not only Hungarian, but of royal blood, declaring her to be a Princess. After all the effort she has put in, however, Eliza is given hardly any credit; all the praise going to Higgins. This, and his callous treatment towards her afterwards, especially his indifference to her future, causes her to throw Higgins' slippers at him, and to walk out on him, leaving him mystified by her ingratitude. Accompanied by Freddy Eynsford-Hill (Jeremy Brett), a young man she met at Ascot and who is charmed by her, Eliza returns to her old life, but finds that she no longer fits in. She meets her father, who has been left a large fortune by the wealthy American to whom Higgins had recommended him, and is resigned to marrying Eliza's stepmother. Alfred feels that Higgins has ruined him, since he is now bound by morals and responsibility. Eventually, Eliza ends up visiting Higgins' mother (Gladys Cooper), who is incensed at her son's behaviour. The next day, Higgins finds Eliza gone and searches for her, eventually finding her at his mother's house. Higgins attempts to talk Eliza into coming back to him. He becomes angered when Eliza announces that she is going to marry Freddy and become Karpathy's assistant. He makes his way home, stubbornly predicting that she will come crawling back. However, he comes to the realization that he has "grown accustomed to her face." Henry returns to his study to lament his loneliness. As he listens to Eliza's recorded voice, she silently reappears in the doorway behind him, leaving the audience to decide what happens next. "Overture" – played by orchestra. "Why Can't the English Learn to Speak?" – performed by Rex Harrison, Wilfrid Hyde-White and Audrey Hepburn. "Wouldn't It Be Loverly?" – performed by Audrey Hepburn (dubbed by Marni Nixon) and chorus. "An Ordinary Man" – performed by Rex Harrison. "With a Little Bit of Luck" – performed by Stanley Holloway, John Alderson, John McLiam, and chorus. "Just You Wait" – sung by Audrey Hepburn (partially dubbed by Marni Nixon) and Charles Fredericks. "Servants Chorus" – sung by Mona Washbourne and chorus. "The Rain in Spain" – performed by Rex Harrison, Wilfrid Hyde-White, and Audrey Hepburn (partially dubbed by Marni Nixon). "I Could Have Danced All Night" – performed by Audrey Hepburn (dubbed by Marni Nixon), Mona Washbourne and chorus. "Ascot Gavotte" – sung by chorus. "Ascot Gavotte (Reprise)" – sung by chorus. "On the Street Where You Live" – sung by Jeremy Brett (dubbed by Bill Shirley). "Intermission" – played by orchestra. "Transylvanian March" – played by orchestra. "Embassy Waltz" – played by orchestra. "You Did It" – performed by Rex Harrison, Wilfrid Hyde-White, and chorus. "Just You Wait (Reprise)" – sung by Audrey Hepburn. "On the Street Where You Live" (reprise) – sung by Jeremy Brett (dubbed by Bill Shirley). "Show Me" – sung by Audrey Hepburn (dubbed by Marni Nixon) and Jeremy Brett (dubbed by Bill Shirley). "Wouldn't It Be Loverly" (reprise) – sung by Audrey Hepburn (dubbed by Marni Nixon) and chorus. "Get Me to the Church on Time" – performed by Stanley Holloway, John Alderson, John McLiam, and chorus. "A Hymn to Him (Why Can't A Woman Be More Like a Man?)" – performed by Rex Harrison and Wilfrid Hyde-White. "Without You" – sung by Audrey Hepburn (dubbed by Marni Nixon) and Rex Harrison. "I've Grown Accustomed to Her Face" – performed by Rex Harrison. "Finale" – played by orchestra. The stanzas of "You Did It" that came after Higgins says "she is a Princess" were originally written for the Broadway version, but Harrison hated the lyrics and refused to perform them, unless and until those lyrics were omitted, which they were in most Broadway versions. However, Cukor insisted that the omitted lyrics be restored for the film version or he would not direct at all, causing Harrison to oblige. The omitted lyrics end with the words "Hungarian Rhapsody" followed by the servants shouting "BRAVO" three times, to the strains of Liszt's "Hungarian Rhapsody" before the servants sing "Congratulations, Professor Higgins". Hepburn's singing was judged inadequate, and she was dubbed by Marni Nixon, who sang all songs except "Just You Wait", where Hepburn's voice was left undubbed during the harsh-toned chorus of the song and Nixon sang the melodic bridge section. Some of Hepburn's original vocal performances for the film were released in the 1990s, affording audiences an opportunity to judge whether the dubbing was necessary. Less well known is the dubbing of Jeremy Brett's songs (as Freddy) by Bill Shirley. With a production budget of $17 million, My Fair Lady was the most expensive film shot in the United States at that point in time. The film was re-released in 1971 and earned North American rentals of $2 million. It was re-released again in 1994 after a thorough restoration. 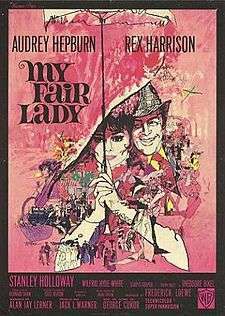 My Fair Lady currently holds a 96% approval rating on Rotten Tomatoes based on 46 reviews, with an average rating of 8.1/10. The general consensus states: "Fans of the play may miss Julie Andrews in the starring role—particularly when Marni Nixon's singing comes out of Audrey Hepburn's mouth—but the film's charm is undeniable." Chicago Sun-Times critic Roger Ebert gave the film four stars out of four, and, in 2006, he put it on his "Great Movies" list, praising Hepburn's performance, and calling the film "the best and most unlikely of musicals." 1 2 3 "My fair lady", Box office mojo . ↑ "My Fair Lady (1964)". IMDB. December 25, 1964. Retrieved November 25, 2015. 1 2 "NY Times: My Fair Lady". NY Times. Retrieved 2008-12-21. ↑ Metz, Robert (July 21, 1975). "The Biggest Man in Broadcasting" (pp. 48-50) New York Magazine, Vol. 8, #29. ↑ Lerner, Alan Jay (1985). The Street Where I Live. Da Capo Press. ISBN 0-306-80602-9. ↑ George Groves Sound History "Making of My Fair Lady" Retrieved on November 27, 2014. ↑ Richard Barriors. "Dangerous Rhythm: Why Movie Musicals Matter". Retrieved October 20, 2016. ↑ "My Fair Lady (1964)". Rotten Tomatoes. Flixster. Retrieved November 4, 2015. ↑ Editors, The (2006-01-01). "Roger Ebert "Great Movies" review". Rogerebert.com. Retrieved 2014-02-05. ↑ "The 37th Academy Awards (1965) Nominees and Winners". oscars.org. Retrieved 2011-08-24. 1 2 Grimes, William (August 15, 1994). "In 'My Fair Lady,' Audrey Hepburn Is Singing at Last". The New York Times. Retrieved 2010-04-23. ↑ "MORE LOVERLY THAN EVER! HIGH DEFINITION UPGRADE OF ICONIC BELOVED MUSICAL" (Press release). HOLLYWOOD, Calif.: Paramount Home Entertainment. September 15, 2014. ↑ Simon Reynolds, "Knightley in talks for 'My Fair Lady'," Digital Spy (June 6, 2008). ↑ "Keira Knightley is My Fair Lady". ComingSoon.net. 2008-06-06. Retrieved 2014-02-05. Green, Benny, ed. (1987). A Hymn to Him : The Lyrics of Alan Jay Lerner. Hal Leonard Corporation. ISBN 0-87910-109-1. Wikimedia Commons has media related to My Fair Lady (film).